Manila, Philippines – There is no better occasion to capture and share the best moments with families and friends than during Christmas. Be prepared with your Christmas gift line-up as Huawei offers an early Christmas treat to give consumers a chance to get hold of its flagship device, the P9 and P9 Plus and save up to 20% off its original price. 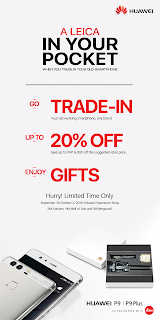 Consumers just need to trade-in selected functioning smartphones at participating Huawei Brand Shops from September 30 to October 2, 2016. They can avail of up to 20% discount when purchasing the Huawei P9 (SRP P23,990) and P9 Plus (SRP P29,990). Consumers will also receive Huawei gift bundles when they avail of the promo. 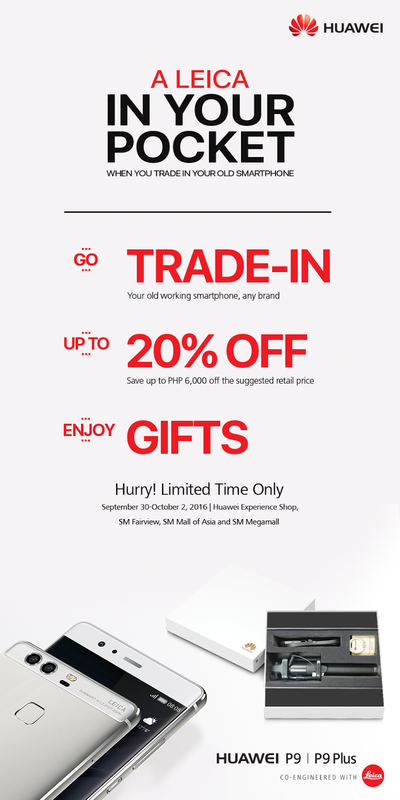 The special promo is valid in the following Huawei Brand Shops: SM Mall of Asia, SM Fairview and SM Megamall. To know more about this promo and other Huawei devices, just visit www.Facebook.com/HuaweiDevicePH.